Hundreds trotted through North Tacoma this Thanksgiving! 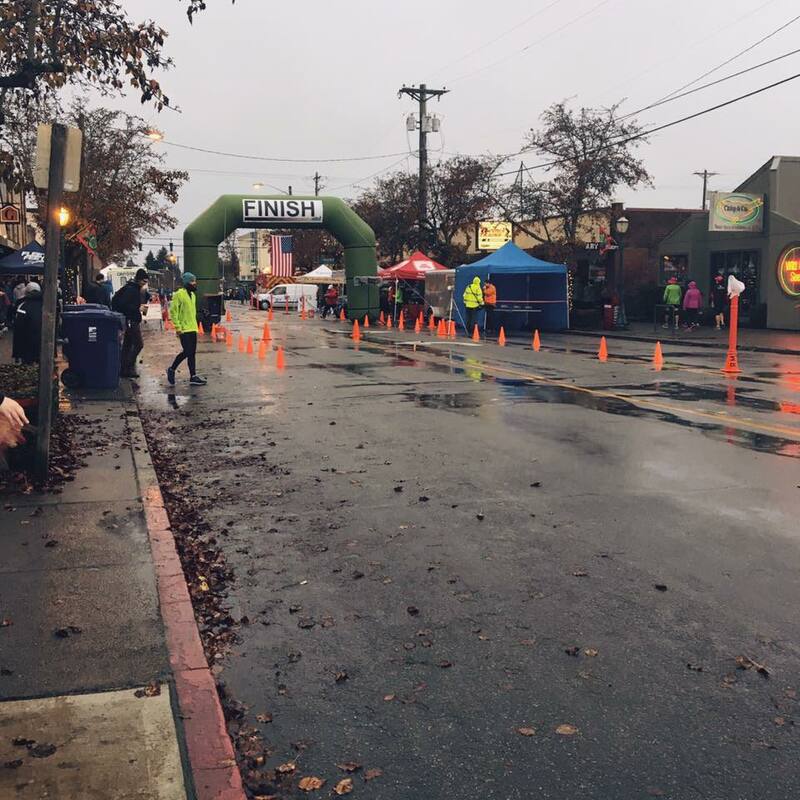 Home › The Run Down › Hundreds trotted through North Tacoma this Thanksgiving! It was a cold, dark morning, but over 900 runners and walkers participated in the Tacoma City Turkey Trot this Thanksgiving. A light drizzle chilled the crowd as they waited at the starting line just outside Fleet Feet Sports Tacoma. At the sound of the gun, the mob of anticipatory turkey trotters shot off. Some were grinning and excited, others had straight, focused lips or wide, nervous eyes, and quite a few were dressed in turkey suits or turkey hats and other fun winter accessories. All together families and individuals trotted a loop through the beautiful Proctor district of North Tacoma and finished in time to get home for Thanksgiving festivities. For many, turkey trots have become a family and community tradition, a way to start a day of feasting with some fun and healthy exercise. Family and friends cheer one another on with shouts, claps, and bells as the runners cross the finish line, proud of having accomplished something that is satisfying for their bodies and souls, whether it is their first or tenth time finishing. Turkey trots are also a time to gather together as a community. Since these races generally meander through a local neighborhood, many residents will stand on their front doorsteps to cheer the participants on as they trot. It is beautiful the way community members support one another. If you haven't participated in a turkey trot before, consider signing up for one in 2017 and invite some family and friends to join you. You can register for the 2017 Tacoma City Turkey Trot online today. The Tacoma City Turkey Trot has been a success since it started years ago and it certainly was again in 2016. In fact, more kids participated in the race this year than in any other Tacoma City Marathon Association event. If you participated this year, be sure to check out the results, photos, and videos at the race website or Facebook page. You may have even won a ribbon for placing in your age group. (If so, you can pick up your ribbon at Fleet Feet Sports Tacoma.) If you missed the Turkey Trot, but still want a chance to run locally this holiday season, consider registering for Santa Runs Tacoma on December 10th, 2016. If you want to register, but you aren't sure how to get started with running, visit Fleet Feet Sports Tacoma and/or take a look at the training programs offered there. More information about these programs can be found here or by phone at 253 272-8890. Remember, every staff member at your local Fleet Feet is here to support you as you get outside and start moving! Questions or comments about this article? Please send us an email.